Emily and her brother Navin head for Kanalis, a beautiful and mysterious city of waterfalls, where they hope to find the antidote for the poison that felled their mother. That cure lies in the eggs of a giant serpent atop Demon's Head Mountain, but the kids' archenemy, Trellis, is headed for the peak, too. A battle that will engulf all of Kanalis is looming. 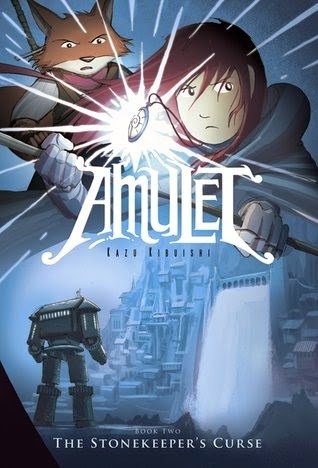 It's up to Em to triumph over evil while controlling the amulet's power ... without losing herself! 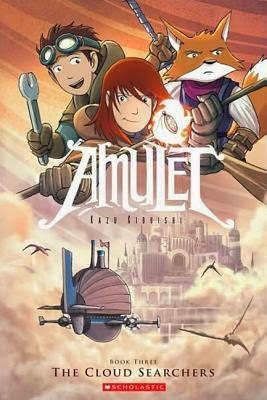 Emily, Navin, and their crew of resistance fighters charter an airship and set off in search of the lost city of Cielis. There they hope to find help from the Guardian Council's powerful Stonekeepers. It's a mission that Alledia's survival depends on, and time is running out--Emily's got to find Cielis before the Elf King finds her. 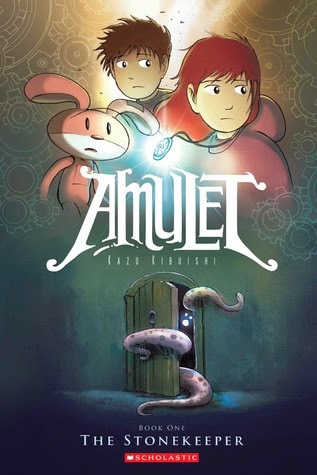 The Amulet Series by Kazu Kibuishi is an exciting middle grade, fantasy graphic novel series. In all the books the pictures are absolutely exquisite. Each page is so detailed and colorful. Emily is our main character and she is now a Stonekeeper and has to go out and save the world of Alledia after inheriting an amulet stone from her great great grandfather. The world in this book is pretty cool even though we still do not know too much about it after the first three books, but I am looking forward to seeing more world building in the next few books. I like how the Emily becomes very powerful when she acquires the stone, but also runs the risk of letting the power overwhelm her and the amulet possessing her. It really makes the story just a little bit darker. With Each book, the story just gets more and more thrilling. The first book had a lot of world building and getting to know the characters in it, but the next book picks right up into the action. Out of these three, my favorite is the third book which is when we really get to jump into the real adventure and get to know a lot of interesting back-story. I feel like the Elf Prince is very similar to Zuko from Avatar: The Last Airbender and I think I'm going to like him. I also really like Emily's younger brother Navin. He seems to always get left out of all the action scenes, but I feel like he has a lot of potential. I hope they will include him in the action more in the next books. It was nice to see Emily and Navin's mom going on adventures with them because I feel like so many middle grade and young adult authors get rid of the parents right away in their novels. I am looking forward to continuing this series. I want a lot more magic. Hopefully, some time soon we will get into more intense action scenes and battles. If you want a cool adventure with monsters, elves and magic, then you should definitely check this book out.